The Brahma sutra is orderly and capsulated presentation of Upanishadic revelations. One intriguing Q is : have you ever listened to the instruction by which unheard is heard, the unthought is thought and the unknown is known ? Centuries ago, there existed the cult of Vaishnavism, there were scholars of Vaishnavaite cult and there are epigraphical evidences of its flourishing stature. 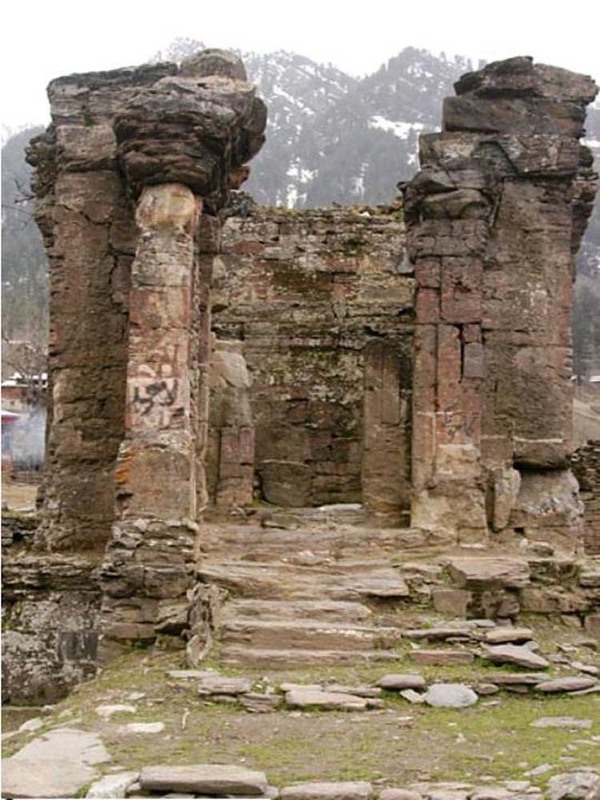 Miles away in the Line of control that divides Pakistan occupied Kashmir from our Kashmir, lies Sharada Peeth, temple dedicated to the goddess Sarasvatī (Sharda), on the banks of Neelum River. Kachmeeram was once centre of learning of Vedic works until the people dwelling before many invasions and killings. Sharada was called Kashmira Puravasini (resident of city of Kashmir) – many web references state that their salutation was " "Namastey Sharada Devi Kashmir Pur Vasini Tvam Ham Prartheye Nityam Vidya Danam Che De hi mey" (Salutations to you, O Sharada, O Goddess, O one who resides in Kashmir. I pray to you daily, please give me the charity of knowledge). The Peedam was the nerve centre of learning and it was the Sharda script which was in use. One report states that shrine did not have a deity but a very large plinth/slab and outside there was a Shivling. Sharda Temple had the main girdle of 22 feet diameter. Nearly a thousand year ago, our Acharyar Sri Ramanujar on a pilgrimmage visited Srinagar searching for manuscript of Bodhayana-vritti, a commentary on the Brahmasutra by Bodhyana. His ardent disciple Kuresar was able to memorise it in one glance; the commentary of Udayavar is known as Sri Bashyam ~ Goddess of learning Saraswathi approving Sri Bashyam conferred the title ‘Bashyakara’ on Sri Ramanujar. Thus was fulfilled the main desire of Alavandhar – writing of an authoritative and illuminating commentary on Brahma sutra. Kashmir is associated with Adhi Sankarar. He is believed to have written ‘Saundarya Lahari’, in praise of Shakti, at the top of the hill, known till then as Gopadari Hill. The Shankaracharya Temple is situated on the top of the Shankaracharya hill, also called Gopadari Hill, in the Zabarwan Mountain in Srinagar, Kashmir. The temple is on the summit of the same name at a height of 1,000 feet (300 m) above the plain and overlooks the city of Srinagar. Much water has flown in the rivers of Punjab tainted by blood – the present day manifestation of Kashmir is not because of rigged elections, interference, lack of cultural understanding – more mess created by unfriendly neighbour who fuels terrorism and tries to keep fermenting trouble. The history of the sublime Valley is regularly punctuated by floods, famines, fires and foreign oppression. About a couple of decades ago, there was exodus of Kashmiri pundits who were forced to flee their ancestral property fearing their lives. The next time you sympathise with the victims of pellet guns used by the CRPF in Kashmir, spare a thought for the security forces in the state. On his feet from 6 am till 8 pm, which sometimes stretches to even 10 pm depending on the mood of the stone pelting mobs, a CRPF trooper’s life is harsh and unforgiving. Away from their families and loved ones, they sleep inside high security barracks, fully camouflaged. Each day they step out wearing weighty helmets, complete with mesh, get into a truck or bullet proof mobile bunkers, again completely meshed for security, along with their weapons, protective shields and gear. Ready for another day of practicing “maximum restraint” while battling huge mobs hurling stones, petrol bombs and grenades and sometimes even random gunfire from militants. The media uproar over the use of pellet guns means even that non-lethal option becomes difficult to exercise. The other option, tear gas, more often than not backfires as the protesters have learnt to pick and throw them back at the forces. In times of peace, they are tasked with connecting hearts with minds. They distribute cricket kits, badminton racquets and other sports gear besides organising tournaments and matches and even give away cash prizes, just to win the confidence of the young Kashmiri. In fact, when violent protests broke out after Hizbul terrorist Burhan Wani’s killing, a badminton court nearing completion near the Eidgah grounds in Srinagar was to be handed by the CRPF to Kashmiri youth. The violence ensured that it remains incomplete, and all the goodwill generated faded into the dust. Many noted Kashmiris say they have been ‘’living in a cage’’ for more than two months now. But who actually is living in a cage, is it the stone pelting Kashmiris who return home, or the trooper in his protective gear, shuttling between his fortified barracks and the daily battles on the streets? Makes a sad reading !